A certain author defines a doctor to be a man who writes prescriptions till the patient either dies or is cured by nature. The Reflector: Representing Human Affairs As They Are (1750). In The Pocket Lacon (1839), Vol. 1, 59. A doctor is a man who writes prescriptions till the patient either dies or is cured by nature. Dissections daily convince us of our ignorance of disease, and cause us to blush at our prescriptions. What mischief have we done under the belief of false facts and false theories! We have assisted in multiplying diseases; we have done more; we have increased their mortality. ... 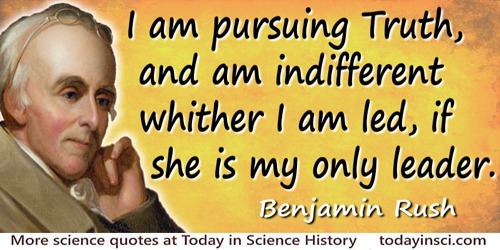 I am pursuing Truth, and am indifferent whither I am led, if she is my only leader. From a public lecture by Rush. Quoted by Isaac Jennings, in Medical Reform; a Treatise on Man's Physical Being and Disorders (1847), 33. I wondher why ye can always read a doctor's bill an’ ye niver can read his purscription. 'Drugs', Mr. Dooley Says (1910). In The Speaker: A Quarterly Magazine (1913), Vol. 8, 147. If there were some deep principle that drove organic systems towards living systems, the operation of the principle should easily be demonstrable in a test tube in half a morning. Needless to say, no such demonstration has ever been given. Nothing happens when organic materials are subjected to the usual prescription of showers of electrical sparks or drenched in ultraviolet light, except the eventual production of a tarry sludge. It is easy to get a thousand prescriptions, but hard to get one single remedy. It is impossible to put together a single prescription that will cure all ailing bodies. The doctor knows that it is the prescription slip itself, even more than what is written on it, that is often the vital ingredient for enabling a patient to get rid of whatever is ailing him. Anatomy of an Illness As Perceived by the Patient: Reflections on Healing (2005), 55. The highest reach of science is, one may say, an inventive power, a faculty of divination, akin to the highest power exercised in poetry; therefore, a nation whose spirit is characterised by energy may well be eminent in science; and we have Newton. Shakspeare [sic] and Newton: in the intellectual sphere there can be no higher names. And what that energy, which is the life of genius, above everything demands and insists upon, is freedom; entire independence of all authority, prescription and routine, the fullest room to expand as it will. 'The Literary Influence of Acadennes' Essays in Criticism (1865), in R.H. Super (ed.) The Complete Prose Works of Matthew Arnold: Lectures and Essays in Criticism (1962), Vol. 3, 238. To find the cause of our ills in something outside ourselves, something specific that can be spotted and eliminated, is a diagnosis that cannot fail to appeal. To say that the cause of our troubles is not in us but in the Jews, and pass immediately to the extermination of the Jews, is a prescription likely to find a wide acceptance. In The Passionate State of Mind (1955), 79. From The Demon-Haunted World: Science as a Candle in the Dark (1996), 26.
Who ever saw a doctor use the prescription of his colleague without cutting out or adding something? The Complete Essays of Montaigne, trans. Donald M. Frame (1958), 584.